I heard this several times, is it really true or just a joke/rumor? The claim is, that "Charlie Chaplin once only came second in a Charlie Chaplin look-alike contest". ... 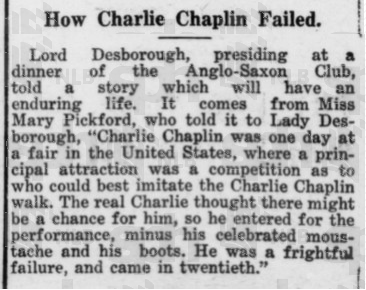 The only real reference I have ever seen to this story is in English newspaper clippings from 1918, when Mary Pickford was in London at an Anglo Saxon Club dinner, and told a story to Lord Desborough who repeated it to the press that Charles Chaplin entered a Chaplin walk contest at a fair in the US and came in 20th. This anecdote told by Lord Desborough, whoever he may have been, was quite widely reported in the British press at the time. There are no other references to such a competition in any other press clipping albums that I have seen so I can only assume that this is the source of that rumour, urban myth, whatever it is. However, it may be true. These examples are all of 1920s gossip columns - simple retellings of a story that was spreading virally at the time. These early versions of the myth all also share many similarities with the Association Chaplin retelling. 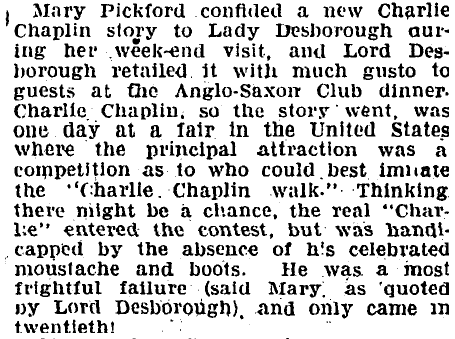 I'm unsure of the location of this Anglo-Saxon club based on any of the articles, and they're also sparse on details (in different ways) on Charlie Chaplin's supposed competition loss. I would say that it's unlikely that any of these particular retellings are true in any way. I have personally read the "My Father" book, while researching this question, and there's no mention of any kind of impersonation or walk contests, even in passing. I paid particular attention to the 1915-1922 period that most of the claims fall into. It's most likely that this story was completely made up, using Mary Pickford's name to lend credibility ('a friend of Mary Pickford's who is friends with Charlie says that...') and spread through gossip columns the world over throughout the following months and years. I find it amazing that despite the wildly varying dates and locations that these retellings state, and the lack of specific dates, times and locations ("a fair in the United States") within the claims, the myth has still survived for almost 100 years. 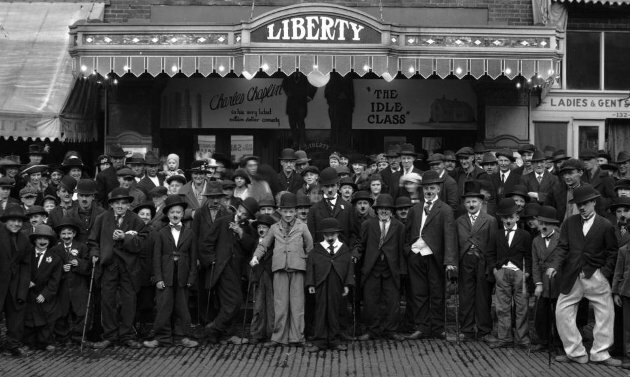 Chaplin did indeed fare poorly in a Chaplin look-alike contest, but the competition took place in a San Francisco theater. His final standing is not recorded, although it was noted that he "failed even to make the finals." Chaplin told a reporter at this time that he was "tempted to give lessons in the Chaplin walk, out of pity as well as in the desire to see the thing done correctly." Milton, Joyce. Tramp: The Life of Charlie Chaplin. New York: HarperCollins, 1996. ISBN 0-06-017052-2 (pp. 92-93). Chicago Herald. 15 July 1915. Vaudeville houses still showed motion pictures in 1915, and many were promoting the Chaplin vogue by sponsoring amateur Charlie look-alike contests. Among the early winners was Bob Hope, who took first prize in a Chaplin contest in Cleveland. Charlie himself was not so lucky. When he entered a contest run by a theater in San Fransisco, he failed even to make the finals. "I am tempted to give lessons in the Chaplin walk" he told a reporter, "out of pity as well as in the desire to see the thing done correctly". The only citation listed for this passage in the book is the very same Chicago Herald for July 15, 1915, Vol. 11, RLC. I am unable to verify the second reference at present, as I am unable to find any archive online for the Chicago Herald, which seemed to only exist under that name for four years. Short of going to a library with access to the archive there does not seem to be a way to verify this reference. Edit: This answer records that the article could not be found. Chaplin's "tramp" character is possibly the most imitated on all levels of entertainment. 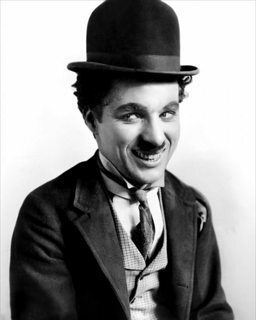 Chaplin once entered a "Chaplin look-alike" competition and did not make the final round. The article also referenced Snopes.com, but they also referenced Howell, Melissa; Howell, Greg; Pierce, Seth (1 August 2010). Fusion: Where You and God Connect. Review and Herald Pub Assoc. p. 275. ISBN 978-0-8280-2547-8. Retrieved 23 March 2011. Not the answer you're looking for? Browse other questions tagged history charlie-chaplin . Was Mozart a music pirate? Did Hitler borrow his mustache from Chaplin? Did Charlie Chaplin write this letter to his daughter? Was pepper once worth its weight in gold? Does Boltzmann's tombstone have “S = k log w” engraved on it? Is this a real astronaut quote?